We have had a fun but busy day. We started our day by going to a birthday party for one of Harper's friends. It was at Gymboree which was such a fun (and easy) place for a party. I'm already thinking we might wind up there for Harper's 2nd birthday. This was the sweet birthday girl - she is two! I have not seen Harper be so still or quiet in months. She was just mesmerized by all the bigger kids but she got to play too! Here she is with her friend Brandon. They were both playing hard to get at this point. (Yes - I LOVE Harper's dress - I got it off ebay for like $10. The brand is Peaches N Cream which makes the cutest stuff. The trick is to find brands you like and check on ebay for those brands in the sizes you want - kids this small only wear things once or twice so it's always in good condition. When I buy her clothes - this is normally what I do). But eventually he made his move! ha! I left directly from there and went to get my hair done while daddy kept Harper for the afternoon. and climbing the baby gates........... ha! Somehow she survived. I ran home and got Harper to bed and got ready and we were off to Scott's work party. I didn't take any pictures of us or the party but I did take a picture of this pretty girl Hannah - because she was Harper's first official baby sitter. Of course Harper was asleep the whole time so she never even knew she had one but we were so thankful to have Hannah keep Harper for us. I am not really quite ready for babysitters other than our parents but I knew Harper would be in good hands! We weren't gone very long. We have a big day again tomorrow so I better run off to bed. Happy Sunday everyone!!! She looks so adorable in that cutesie dress! Glad y'all had a good day! Precious pictures...I love that he was holding on to Harper- adorable! Harper is so cute, and Brandon is such a doll! I love his chubby cheeks. He reminds me of my little boy. Gymboree looks like a really fun place. Harper was really wide-eyed taking it all in. Way to go Brandon! Some things are just genetic after all.ha! Happy Birthday Neely. What a cutie. Dawson looks so cute under your tree. That is my cat's favorite spot, too. The dog is way too big and is probably jealous. Keeping yo in my heart in Ga.
cute cute and cute. 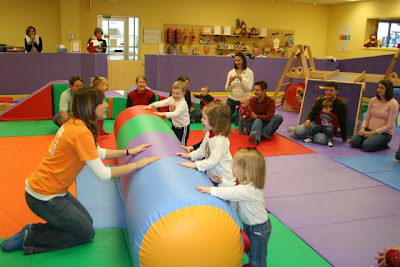 Lauren goes to the Little Gym on Tues. mornings, just like Gymboree. You should totally do it! It's the highlight of our week. Awesome! I'm pretty sure I just figured out where we're having Grace's 3rd birthday party!! I love that little dress Harper has on!! Who said playing in the trash wasn't fun?? We love Gymboree! I was the same way about babysitters with my first, but when the second rolled around we got brave and left her for an hour with with a non family sitter. All went well. It does get easier to leave them with sitters. Looks like a fun day! 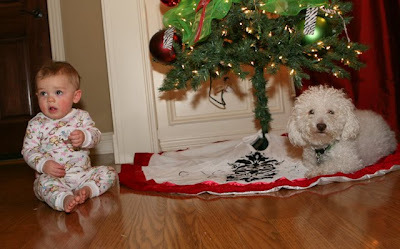 Our bichon loves to lay under the tree just like Dawson. Oh, LOVE that pretty baby sitter!! She happens to be our favorite baby sitter too, long distance and all. 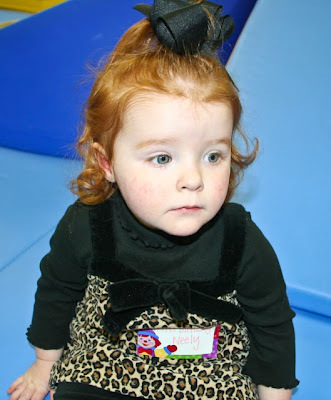 Harper looks so cute at the "big girls" birthday party. Fun!! 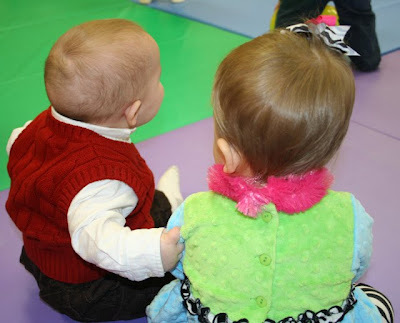 After I wrote that last post, I got to thinking about how I used to be your baby sitter's baby sitter! I'm sure I was her favorite :) She and her brother sure were my favorite to babysit. Dawson looks very comfy too! Love them HOGS! I went to UofA, wow, too long ago! I love NW Arkansas. I miss it, but I do love living in Gemany for awhile. My sister still lives in Fayetteville. If you ever need a dentist or an optometrist......my sister is a dentist in Fayetteville and my brother in law is a optometrist in Rodgers! 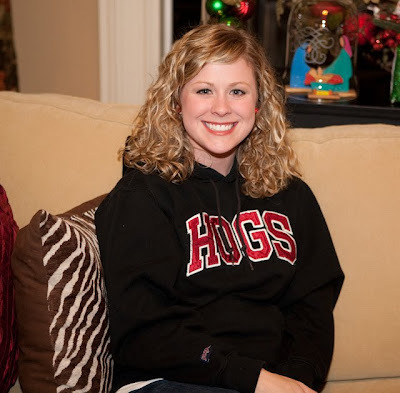 :) Go Hogs! Harper looked like she was having so much fun! I love her zebra outfit! Super Cute! LOL about her little boyfriend making his move! Super funny! Oh my gosh, she looks so cute in that outfit. I need one of those for my 2 year old! Please share where you got that! Love, love, love the zebra outfit? Where in the world did you find that? Evie loves Gymboree too. We go every Monday. It's so much fun and wears her out for a nice LONG nap. Harper seems to like parties. She looks like a big girl! Hope you had fun at the party. Such a cute post! I love that trash can picture! Hannah is my TC pledge sister! Good choice for the babysitter! :-) I started reading your blog long ago when Harper was first born (Hannah and Kayla actually told me to read and pray) and I still read it! I actually just started blogging and am studying blogging communication in my graduate classes. I'm hooked! I LOVE her zebra dress - where is that from?? Looks like Harper had a lot of fun at the birthday party and what an adorable birthday girl! i'm just wondering and you might want to consider for next time harper actually meeting her babysitter...don't you think she would be scared out of her mind if she would have woken up to a complete stranger??? Looks like you all had a fun time! Good job this morning! She is so adorable. I always love stopping by here and seeing that sweet face. Just wait till you leave her with daddy and come back to her on a ladder and using an electric screwdriver to screw in dry wall ALL BY HERSELF, while daddy watches! Oh, and she was only 4! I know God lets mom nurture and keep safe, while dads share the world - but yikes, do we have to parent so differently? Love your blog and how positive you are. 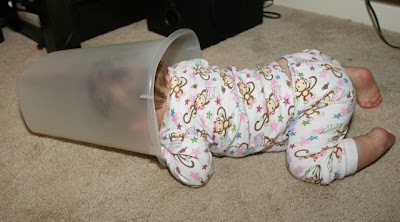 LOL at playing in the trash! Love it!! Hannah looks sooooo adorable and responsible. Do call her again soon so you and Scott can have a date. If not, send Hannah our way. :o) Great sitters are hard to find, so grab that sweet Hannah and don't let her go! Those pics are soo cute and I love how he grabs onto her like "don't leave me". I absolutely love her outfit. I'm in love with zebra and her outfits are always adorable!